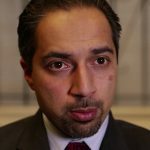 Recognizing that in today’s geopolitics, no idea is bad enough to be put to rest, we draw on a 2013 interview with Trita Parsi, founder and current president of the National Iranian American Council, author of Treacherous Alliance: The Secret Dealings of Israel, Iran and the United States (2007) and A Single Roll of the Dice: Obama’s Diplomacy with Iran (2012). The interview took place during a period of mounting US pressure on Iran to cease their nuclear program, but before the Joint Comprehesnive Pan of Action that the Obama Administration signed with China, France, Germany, Russia, the United Kingdom, and the United States, the European Union, and Iran. Parsi’s warnings then about the perceived ‘military solution’ are as relevant today as they were then.